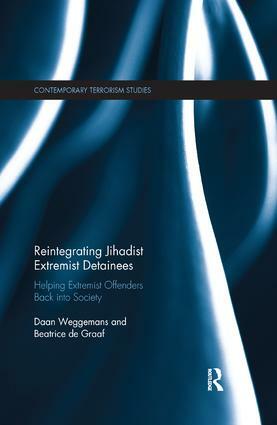 This book seeks to understand the processes of reintegration of former Jihadist detainees, as well as the role that the police and other frontline professionals play in this process. Over the past few decades the number of people who have been detained under the suspicion of terrorist activities has grown significantly. This has resulted in an increased scholarly interest in the topic of prisons and terrorism. However, the main focus of academic research has been on the period of incarceration with researchers paying extensive attention to the conditions under which terrorists have been detained as well as to various processes of alienation and (violent) radicalisation that sometimes take root while in prison. Much less has been written about the period after their incarceration and the steps being taken to prepare them for that transition. This book seeks to fill this gap. It argues that sentencing or incarcerating terrorism suspects is not the end of the story, but just the beginning of the next phase: a process of reintegration, or the start of a new cycle of violence. This exploratory study outlines the factors during and after detention that contribute or hinder the reintegration of those who have been incarcerated for violent extremism and terrorism. The overriding aim of this work is to facilitate further research into the radicalisation and de-radicalisation of jihadist suspects. This book will be of much interest to students of terrorism and counter-terrorism, Islamist radicalisation, criminology and security studies in general. Daan Weggemans is Researcher and Lecturer at the Institute of Security and Global Affairs (ISGA), Leiden University, and Research Fellow at the International Centre for Counter-Terrorism (ICCT). Beatrice de Graaf is Professor for the History of International Relations and Global Governance at Utrecht University, and author of Evaluating Counterterrorism Performance: A Comparative Study (Routledge, 2011).